In 2006 I purchased a Canon Digital Rebel and a couple of lenses to take pictures of my hobby of high power rocketry and return to a love of photography that I left behind in school. After posting some pictures to an online rocketry forum, I was contacted by the editor of Launch Magazine and asked if I would sell them the photos I took of a particular project for an upcoming issue of the magazine. This started my affiliation with Launch Magazine as a freelance contributor of articles and photos, including a few cover shots, for three years until they ceased publication. I branched out into event and expedition photography making pictures for NASA, Sally Ride Science and publications around the world. Until 2012 photography was just a part time endeavor I enjoyed while my “day” jobs consisted of my own manufacturing company, a manufacturing consultancy practice, designing and building electronic systems for a start-up aerospace firm and working as a precision aerospace machinist. While I still enjoy electronics, mechanics and engineering design, I have made the decision to turn my working life upside down and make photography my full time job. Everything else is now the stuff I do on the side for fun and a little extra profit. When I’m not shooting pictures I play drums, slowly work on several books I have in progress and cook. I may also be reading or watching training videos to expand my knowledge and toolbox of photo techniques. I also do product photography and work with other photographers making portraits and photos of kid’s sports teams. Photography is not just a job, it’s a passion. 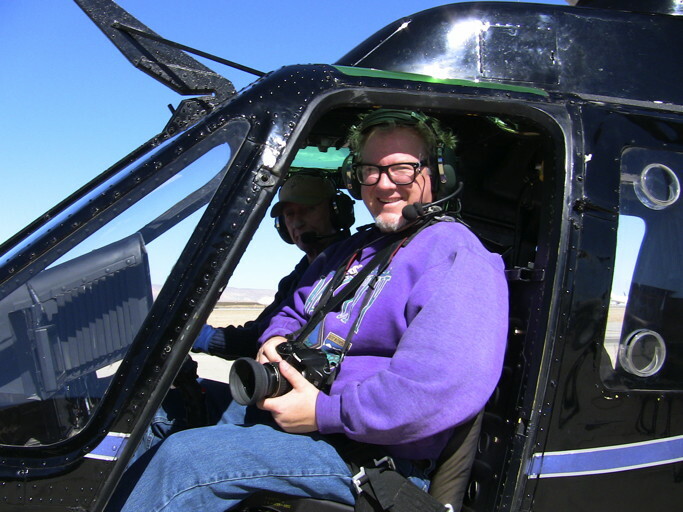 Above is a photo of me returning from an aerial photography assignment with aviation legend Sean Roberts. I love hanging out of the side of Jet Ranger helicopter making photos! It beats Magic Mountain every time.